In this file photo taken on Friday, Sept. 7, 2012, Maria Butina walks with Alexander Torshin, then a member of the Russian upper house of parliament, in Moscow, Russia. 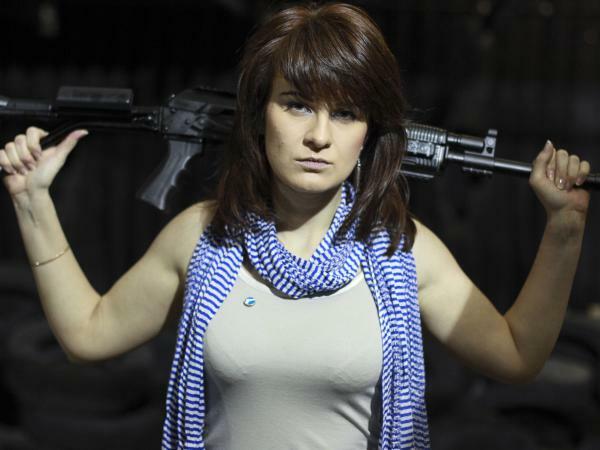 Maria Butina, seen here at a Russian shooting range in 2012, belonged to a relatively small group of gun enthusiasts around Moscow. Her connections included National Rifle Association officials, gun lobbyists, a Justice Department staffer, a congressional aide, the top organizer of the National Prayer Breakfast and an executive with the Outdoor Channel. She was even friends with the top senior enlisted leader at the Navy's West Coast center for handling nuclear weapons. Her collection of Facebook friends told the story of a woman who has been working for years to change minds on gun rights first in her home country and then in the U.S.
Today, Butina is in jail ahead of her trial on charges of alleged conspiracy and allegedly serving as a foreign agent. Prosecutors argue – and a federal judge has agreed – that she poses too great a risk of trying to flee back to Russia. Butina's attorney argues that the government has badly over-hyped her case. Neither the Justice Department nor Butina's lawyer could comment for this story because of a gag order imposed by a federal judge. People who knew Butina in her home country marked her early as driven. She also was unusual in another way: An enthusiastic shooter and a campaigner for gun rights in a nation with no 2nd Amendment. 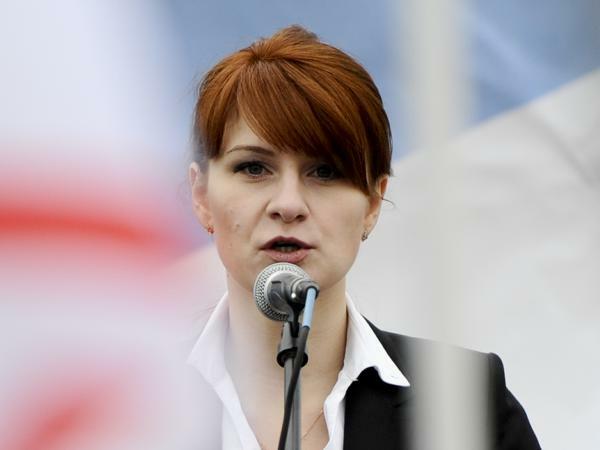 "The practical shooting community in Moscow is rather small, so everyone will meet everyone eventually," said Tim Kirby, who knew Butina there. "She is very libertarian, pro-American and pro-2nd Amendment ... I always thought she would be more likely to import American ideas rather than allegedly exporting Russian ones." With no group at home like it to join, Butina became a member of the American National Rifle Association and founded one of her own for Russians: the Right to Bear Arms. She told one Facebook friend in the United States who was angry about California's gun restrictions that he should take to the streets. "I'm not familiar with your laws, but I think you need to hold demonstrations!" Butina told the activist in 2014, according to the messages shared with NPR. People in Russia found this odd; using groups and rallies to try to sway public opinion is a Western model, not one often seen there. "There is no necessity to do [an] advocacy campaign in Russia because ... key decisions [are] made without society support," said Ilya Shumanov, who organizes the annual Franz Kafka and George Orwell Intellectual Forum in Russia, where Butina once spoke. The evidence suggests that Butina truly believed in gun rights, not that she was running a counterfeit campaign. "She appeared to me [to be a] really smart and determined person believing in her cause and able to rally people around it," said Stanislav Byshok, a Moscow elections analyst. "She often took [the] NRA as an example for the Right to Bear Arms movement. That's why I wasn't that surprised when got the news that Maria decided to relocate to the U.S."
Butina turned up in the United States in 2015, captured on camera asking Donald Trump a question about Russian sanctions at a conference in Las Vegas called FreedomFest. She would eventually come to see Trump as a bridge between Russia and the United States – but he wasn't her first choice for president. "At the time, she was a Scott Walker fan," said Kevin Boyd, who attended the FreedomFest conference that year. Butina reportedly encountered Walker twice during the 2016 presidential campaign, once before the governor formally entered the race, then again at his formal campaign launch. She was accompanied in Las Vegas by her boyfriend, Republican operative and fundraiser Paul Erickson, who has been identified in court documents as "U.S. Person #1." They already were spending a lot of time together, including at the time Butina gave a speech at the University of South Dakota in April 2015. The university told NPR that Erickson had helped arrange Butina's speech on the need to change Russian gun laws. "She had mentioned growing up and hearing stories about women who had been attacked on the way to work in Russia," said Jenna Hayes, a student who attended. Erickson and Butina later visited Erickson's mother at a nursing home in Washington state. "I sang for her and her very good friend Paul on at least three occasions at a seniors home where Paul's mother resided," said Jim Betteley, a member of a local barbershop quartet. "They were in love, that much was crystal clear. They still are." By 2016, Butina made Washington, D.C. her home base. In May of that year, Erickson wrote to then-Sen. Jeff Sessions under the auspices of the National Rifle Association to offer a "back-channel" that connected the Trump campaign and the Russian government, including the prospect of a meeting with Russian President Vladimir Putin. Donald Trump Jr. did meet briefly with Butina and a Russian official at that year's NRA convention, but the meeting with the top leadership never happened. The Russian official who was Butina's mentor, Alexander Torshin, had also been working for years to influence events in the United States and is now under sanction by the U.S. Treasury Department. In November, after the election, Butina and Erickson threw a costume party at Café Deluxe, near campus, where she appeared as Russia's Empress Alexandra and he came as Rasputin. Erickson told people at the party that he was on Trump's transition team. That doesn't appear to have been true. But somewhere along the line between that time and her arrest, Butina began to be observed meeting with Russian diplomatic officials around Washington. A surveillance photo released by the Justice Department showed her dining with a man whose face is obscured at what is believed to be a bistro in Northwest D.C.
One political aide who knew Butina, and asked not to be identified, said those kinds of meetings raised his eyebrows. "It was very peculiar that a simple student without any connections in the Russian community groups in the United States, [who was] not working for the Russian government, was that well connected." To the Russian woman named Maria Butina who's been accused of serving as a clandestine Russian agent here in the United States - she is in jail awaiting trial. She didn't always have the high-level connections like the ones she is now accused of having. NPR's Tim Mak has been digging into Butina's contacts, into her social network and learning about her story from before she left her home in Russia. Hey there, Tim. TIM MAK, BYLINE: Hey, how are you? KELLY: So I'm well. Thank you. So we have talked about Maria Butina on this show a lot, always in the context of the Trump campaign and possible links between that campaign and the Russian government back during the 2016 election. What do we know about who she was before that? MAK: So she was one of the rarest things in the world - a Russian gun rights activist. Of course, there's no Second Amendment in Russia. Guns aren't that common. It's not a free society. And most people don't campaign publicly for things if it's against the wishes of the government. Most people in Russia don't believe that laws are changed through public advocacy and rallies, for example. But Butina did. People who knew her in high school and college described her as not an especially friendly person, but a super ambitious person who knew what she wanted and has always been a big advocate for guns. Here she is on a podcast with conservative political operative Grover Norquist in February 2016. MARIA BUTINA: I'm with guns from my childhood. My father is a hunter and grew up in Siberia. So it's hard to imagine life without guns. MAK: So when there was no gun rights group for her to join, she joined our American National Rifle Association. Then she formed her own gun rights group in Russia, inspired by Mikhail Kalashnikov, inventor of the most famous gun in the world, the AK-47. KELLY: Yeah. The AK-47. OK, so walk me down this path that she walked from joining the NRA, starting her own gun rights group in Russia to someone who became really involved in American politics. MAK: Yeah. So she starts off in Siberia. She goes to Moscow. And she wasn't alone. She began to recruit other people. The Russian government appears to have gotten involved, especially a man named Alexander Torshin. He's a Kremlin-linked Russian official, and now he's actually sanctioned by the U.S. Treasury. Here is how Butina describes him in that 2016 podcast with Norquist. BUTINA: He works as a deputy governor of Russian central bank, and I work as his special assistant. He's a big supporter of gun rights in Russia. He travels to annual meetings in America for the NRA. MAK: So I reached out to 200 of her Facebook friends, and this allowed us to do some in-depth reporting. KELLY: Two-hundred, OK. Go on. MAK: Two-hundred. And she has thousands of Facebook friends. So we did some in-depth reporting for npr.org. We traced her childhood in Siberia to the tight-knit competitive shooting community in Moscow to her trips to the United States and interaction with conservative groups to the jail cell she now sits in in Alexandria, Va., accused of being a covert foreign agent for Russia. KELLY: And what's the picture you've been able to build from all those connections and this network she built here in the States? MAK: So the Russian government and Butina and her lawyer all say that she's the victim of an overzealous prosecution and that the poor U.S.-Russia relationship following the Russian government's interference with the U.S. 2016 election is one of the major reasons why she's now awaiting trial. But if she was an innocent gun rights activist, there certainly are a lot of suspicious activities she was involved in. Here's what it looks like now. Butina got started in this world of gun rights and politics on her own, for her own purposes, and years before the activities that now have her under suspicion. So it appears she was involved in the Russian - if it appears that she was involved in the Russian active measures being waged against United States, it was because she was in the right place at the right time. KELLY: As is our political reporter Tim Mak. Thanks, Tim.